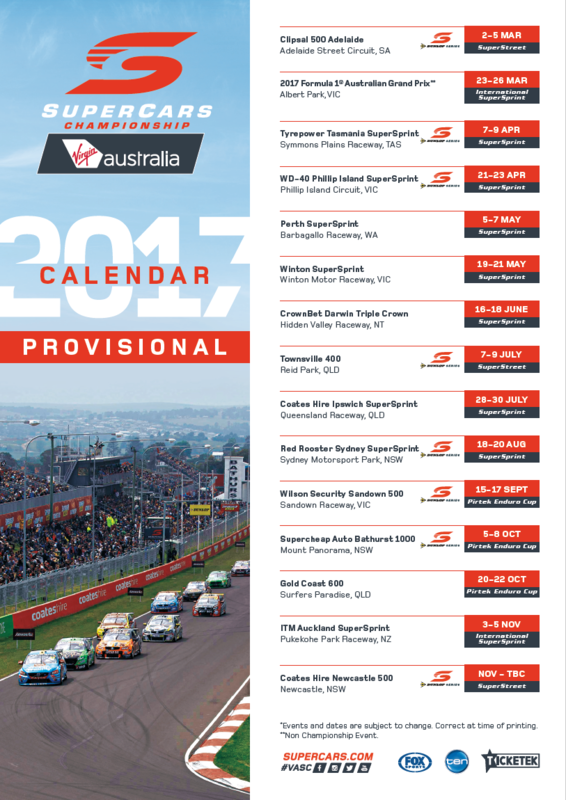 The Virgin Australia Supercars Championship has released next year’s racing calendar, after confirmation of the 2017 grand finale in Newcastle. Racing will remain mostly on local shores as Supercars focuses on expanding into Asia for 2018. The schedule will be similar to this year, which has seen exciting Supercars action and the closest season start in history. Releasing the 2017 provisional calendar, Supercars Chief Executive James Warburton welcomed today’s announcement. “Once again in 2017 we will travel to every state and territory in Australia with the exception of only the ACT and host some of Australia’s biggest sporting events including the Supercheap Auto Bathurst 1000 from 5-8 October. The 2017 calendar will start with Clipsal 500 Adelaide on 2-5 March with Newcastle to be the final event. There will be eight Dunlop Series races in 2017 including a non-championship event at the Supercheap Auto Bathurst 1000. Warburton said Supercars was still exploring options for races in Asia including Kuala Lumpur which was cancelled this year because of a legal dispute involving local promoters. The 2017 Virgin Australia Supercars Championship will be officially launched in Adelaide in February ahead of Clipsal 500 Adelaide. Register your interest for 2017 event tickets below.